In a technological advance that opens up new possibilities in the fields of robotics and wearable computing, researchers at the University of Tokyo have developed a stretchable, rubbery material that conducts electricity and can be incorporated into electronic devices. The researchers -- led by assistant professor Takao Someya of the University of Tokyo -- were able to create elastic electronic circuits that could be stretched up to 1.7 times their original size without affecting performance, thanks to conductive wires made from a new carbon nanotube-polymer composite they developed. In recent years, scientists have made advances in blending carbon nanotubes (good conductors of electricity) with polymers to make flexible conductive materials, but success has been limited because nanotubes tend to cluster together, causing the composite to harden when too many nanotubes are added. The University of Tokyo researchers were able to overcome this hurdle by mixing the nanotubes with an ionic liquid containing charged particles that keep the nanotubes evenly distributed and prevent them from clumping together. The result is a stretchable material that conducts electricity more than 500 times better than other commercially available carbon nanotube-polymer blends. With the list of potential uses of stretchable electronic circuits limited only by the imagination, the researchers envision applications ranging from high-tech suits that enhance athletic performance and monitor the wearer's physical condition, to soft machines with flexible mechanical parts. For robots, elastic electronic circuits will enable layers of soft, sensor-laden skin to be stretched tightly across the curves of their bodies, giving them both a more lifelike appearance and greater sensitivity to touch. The research results were published in the online edition of Science (August 8). 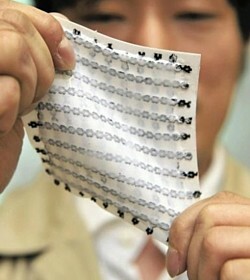 Is there already sensate synthetic skin? If not, could this fill that void?